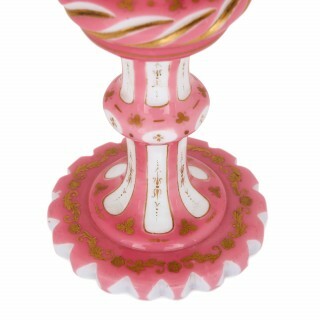 This beautiful, precious cup represents some of the best in Bohemian glass design in the 19th Century. It was the Bohemian glass makers in the 19th Century who perfected the technically challenging technique of glass overlay, which involves placing layers of differently coloured glass over one other, and carving away parts of the layer to reveal the different coloured glass beneath. 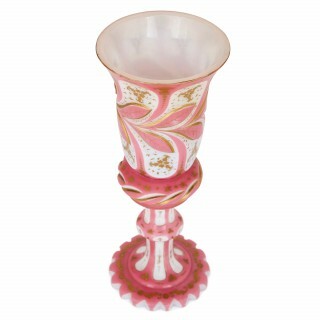 On this cup, the maker has overlaid a beautiful pink glass layer on a white opaline ground, and cut away to create a mesmerising swirling, curving pattern. 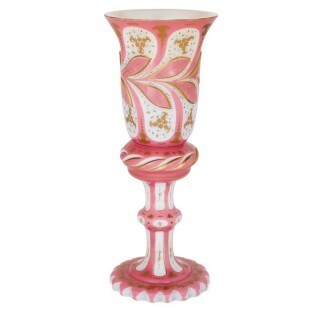 Additionally decorated with gilt floral motifs, this goblet will make a stylish and colourful addition to the dining table, or to a collection of antique glassware. 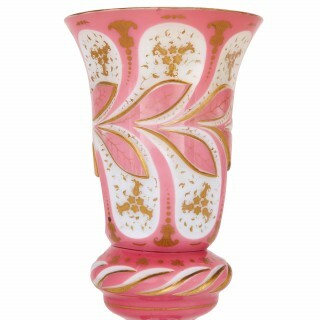 The design on the glass shows alternating pink and white strips and panels, together with a leaf design on the body of the glass. The cup is further decorated with parcel gilt highlights throughout, showing fleurs de lys, leaves and other floral motifs.